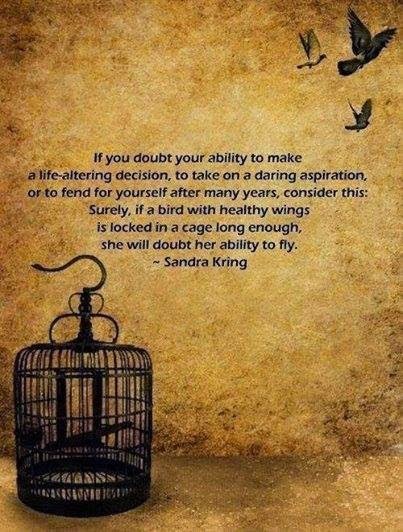 We all doubt our abilities to do things, but will it be your doubt to hold you back and keep you stuck from your aspirations or will you unlock the cage, spread your wings and fly? There is always uncertainty regarding something in our lives: a new job, relocating, going back to school, getting married, or having children. For me, its deep and passionate love. Am I complacent in my ways thinking that it will never happen or that I am doing okay the way I am now? I am sure I may be at times, but flying, in my opinion, is not a rash decision, either. We are not birds; we are humans. The process of stepping forward is just that: a process which takes risk resulting in some fear. A decision needs to be thought through; it's just knowing when it's time to jump (or fly). Waking up to live is not about making life-altering decisions, taking on daring aspirations, or, perhaps, fending for yourself after many years irrationally. Sometimes people think that that is all they have to do is just jump in without thought to overcome their doubt or prove to themselves (or others) that fear isn't holding them back. Waking up to live is not about that. Waking up to live is about consciously weighing your options, doing some soul-searching and research, asking questions, and then jumping in if and when it's right. Waking up to live is not the unconscious risk-taker. Waking up to live is conscious thought: realize your doubt, feel your doubt and fear, acknowledge your doubt, and see it for what it truly is; then walk through it knowing you have the strength to pass through it.